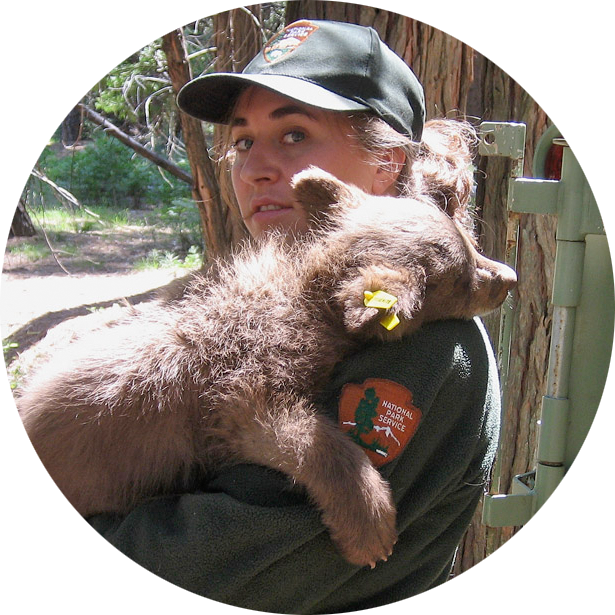 The single most important thing we can do to protect Yosemite’s bears is to store our food properly to prevent bears from becoming conditioned to human food. Bears are food-driven animals. They are quick learners, have a powerful sense of smell, and are on a constant search for food wherever they can find it. If a bear obtains human food, it will likely return again and again for an easy meal. Food-conditioned bears may quickly lose their fear of humans (become habituated) and can become aggressive. They may bluff charge, chase people away from food, or break into vehicles causing significant damage to personal property. Tragically, when a bear becomes aggressive, park rangers are often forced to kill the bear in the interest of public safety. By storing your food properly, you can save bears’ lives. 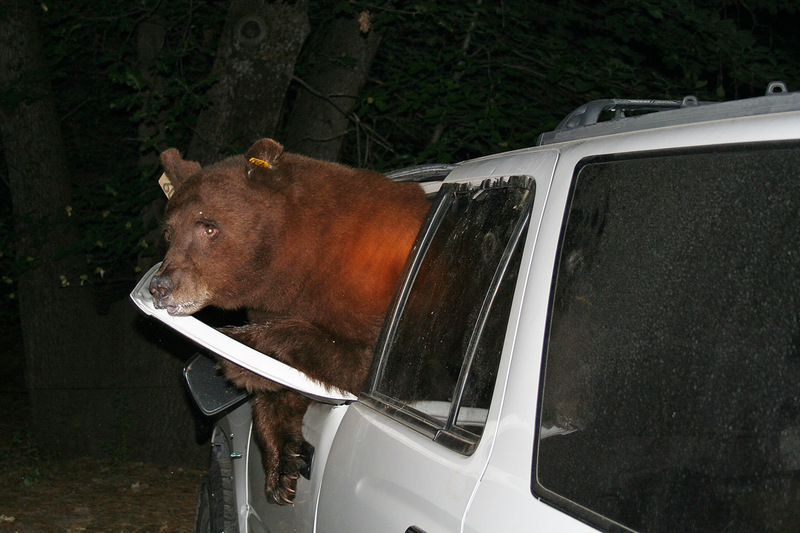 Not only is proper food storage important to the welfare of Yosemite’s bears, it’s required by law. Failure to store your food may result in a citation of up to $5,000, your car being impounded and/or eviction from your campsite or lodging facility. You may store food inside your car (out of sight, with windows completely closed) only during daylight hours. You may not leave food in a pickup truck bed or strapped to the outside of a vehicle at any time. 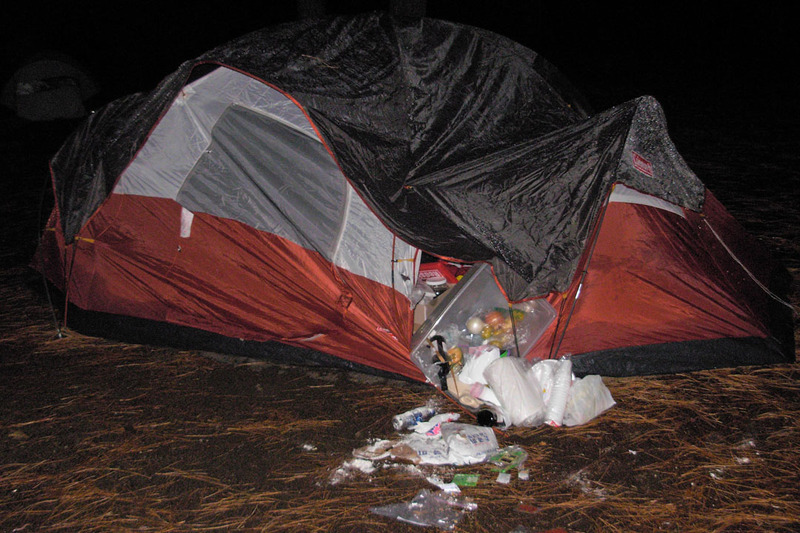 Do not store food in your car after dark or if you are in a campground day or night: use a food locker. Remember to clear your car of food wrappers, crumbs in baby seats, and baby wipes–and even canned food and drinks. Think about packing all your food and related items together for easy removal from your car upon arriving in Yosemite. 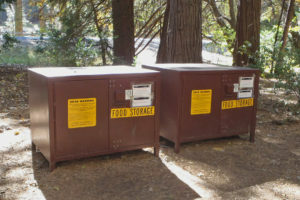 Food lockers are available at Half Dome Village (formerly Curry Village) parking lots and at nearly all trailhead parking areas. Do not leave food, drinks, toiletries, or other scented items — including ice chests or boxes containing these items — strapped or otherwise attached to the outside of your RV. In campgrounds, Housekeeping Camp, and Half Dome Village (formerly Curry Village) tent cabins, you must store all your food in food lockers. Bears may enter campsites even in your presence (see photo above), and some will even check lockers to see if they’re latched. Food lockers are available at every campsite, Housekeeping unit, and Half Dome Village tent cabin. 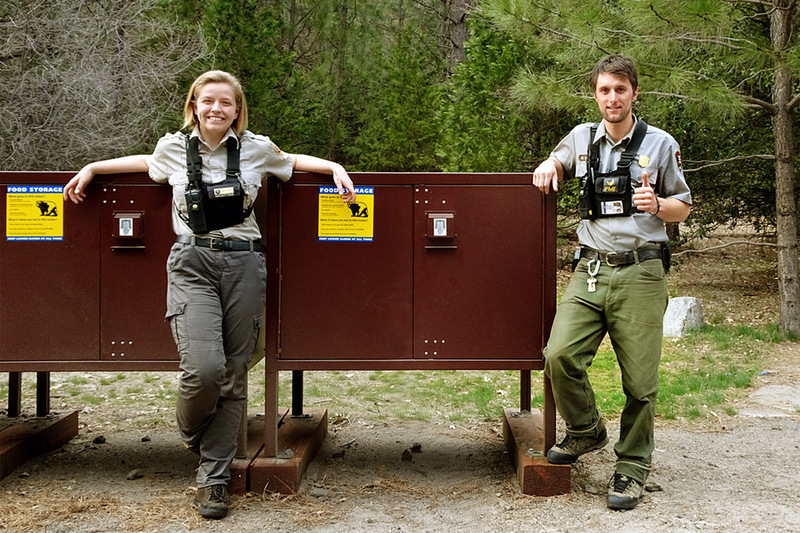 Bear resistant food containers (“bear canisters”) are required for overnight hikers throughout the Wilderness (counterbalance food hangs are no longer legal because bears have learned to get food stored this way). 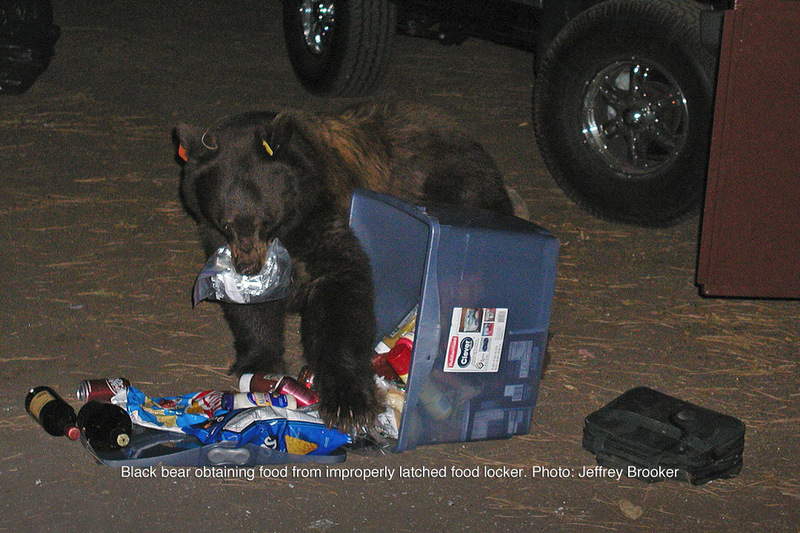 In Yosemite and the southern Sierra, bear resistant food containers are the only effective and proven method of preventing bears from getting human food.